This simple and delicious chicken recipe provides a nice break from ordinary grilled chicken breasts. 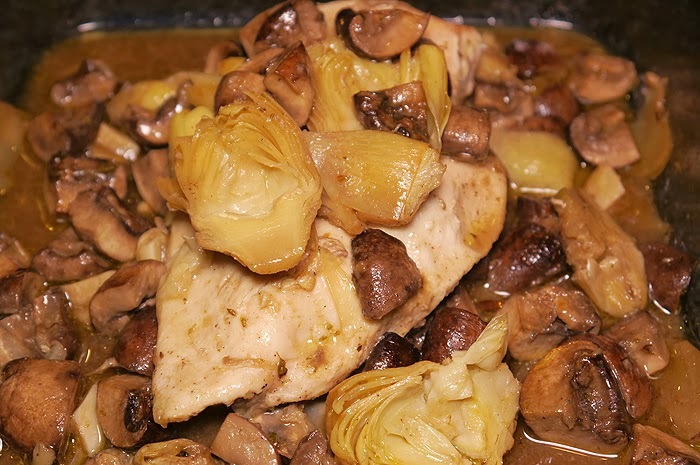 Roasted with artichoke hearts and mushrooms, in a savory mustard wine sauce, guests will think it took hours to make. In reality you can have this meal on your table in less than an hour. An added bonus for those, like myself, that try to eat healthy this dish is relatively low in fat and a great choice for a weeknight dinner. Serve it up alone or pair it with some pasta or rice for a nice well rounded meal. Season chicken breasts with salt and pepper, then place chicken, artichokes, and mushrooms in a medium sized roasting pan. In a small bowl, mix together the remaining ingredients. Then pour over chicken and vegetables. Roast for about 30 minutes, or until chicken is cooked through. I'm always looking for new chicken dishes. This sounds delicious, and I love that it's healthier too. Thanks for linking to the In and Out of the Kitchen Link Party. Hope to see you next week.